The Rustle of Language is a collection of forty-five essays, written between 1967 and 1980, on language, literature, and teaching—the pleasure of the text—in an authoritative translation by Richard Howard. 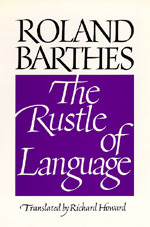 Roland Barthes was born in 1915 and studied French literature and classics at the University of Paris. After teaching French at universities in Rumania and Egypt, he joined the Centre de Recherche Scientifique, where he devoted himself to research in sociology and lexicology. He was a professor at the Collège de France until his death in 1980.